KOKOMO, Ind. 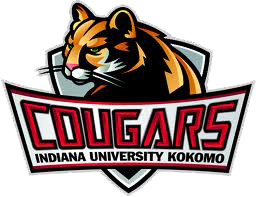 – Indiana University Kokomo improved their record to 4-14 in front of a home crowd on Thursday night defeating Indiana University Northwest in straight sets (25-15, 25-18, 25-11). Coach Kristen Snoddy and the team knew there was an opportunity for a home victory against the RedHawks who came in struggling with a 1-12 record. On paper, the Cougars were the favorite and Snoddy expressed her excitement with the growth her team showed in meeting those expectations. Juniors Carless Davis (Medaryville/West Central [Ancilla College]) and Miranda Hammons (Indianapolis/North Adams Jerome [Ancilla College]) led IU Kokomo at the net with eight kills each for IU Kokomo. Freshman setter Courtney Hanson (Logansport/Pioneer) had a team high 14 assists and sophomore Lael Burrus (Denver/North Miami) led the way with 12 digs on the defensive end for the Cougars. “Cortney Hanson had a great all-around performance and her serving gave Northwest some fits,” said Snoddy. The Cougars return to action on the road this Saturday in Lima, Ohio for the University of Northwestern Ohio (UNOH) Tri-Match. IU Kokomo takes on the host team UNOH (11 a.m.) followed by a match-up against Ursuline College (2:30 p.m.).